Public rate NHS England higher than GPs and Hospitals! The latest data from the NHS England Insights dashboard shows that the public are making more positive comments about NHS England on social media than negative ones this compares far more favourably than comments the public are making about General Practice and Hospital Services. 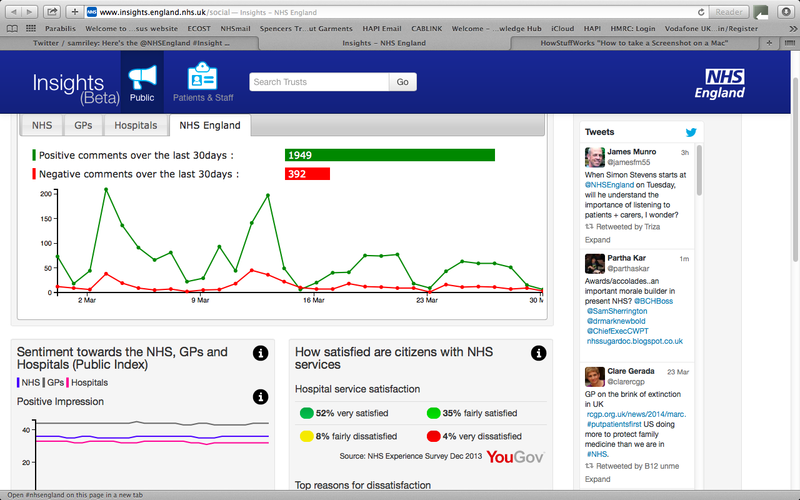 What is the NHS England Insights Dashboard? What does the March Insights Dashboard tell us? There are a number of possible conclusions here. The first is that NHS England is simply so good that the public holds it in very high regard and this is reflected fairly in the scoring. Second, it could be that as a national agency it may be that NHS England staff and their associates use social media more in the course of their work and are more likely to say positive things about NHS England. Furthermore most members of the public have no idea about NHS England at all so are unlikely to comment or complain about it. The March dashboard includes the period of the NHS Expo. Third, it might be that most of the negative comments about hospitals and GPs could be about the cuts. 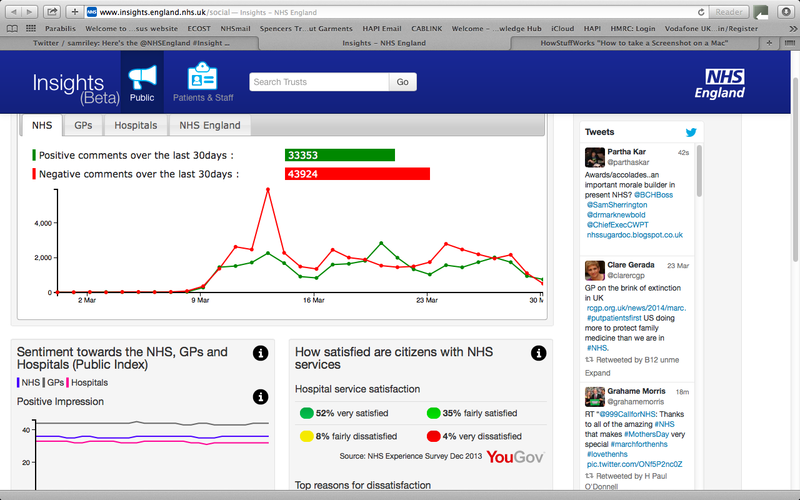 Since publishing this blog Steven McDermott at the University of Leeds has sent me a link to a social network analysis he has done of tweets about the NHS – 400,000 tweets by 21,000 over a month. You can see it here. So on the surface it might appear to be a real opportunity to attempt to analyse these. However, so far the insight tool reach seems very limited for example for GPs (using the data above) it only captured comments that equate to about 16 comments per CCG (N = 211). What is meant by hospitals – Acute, Community etc? Of course it could just be that the Insights Dashboard is just not very good… and that this is an example of an ambition to innovate distracting us from focussing on current priorities. ← BMA survey of public health workforce – transition and division?